Many of the news stories about African Union (AU) member-states focus on the outbreak of infectious diseases which are a direct result of the legacy of colonialism and neo-colonialism, where the healthcare institutions were deliberately left underdeveloped. A conference held recently in the Republic of South Africa discussed the potential for the building of a universal system for providing medical care in the most industrialized state on the continent. In the aftermath of the Universal Health Coverage (UHC) Summit, the South African cabinet approved recommendations from the conference by drafting a National Health Insurance (NHI) bill to be deliberated on within the National Assembly. Such a breakthrough in South Africa could provide a blueprint for the AU member-states as a whole. South Africa at present is undergoing a “technical recession” exemplified by stagnant wages, unemployment reaching record levels along with instability in the financial sector. These problems make the imperative of revamping the healthcare system more urgent although it poses profound challenges to the state. Statistics published in 2012 indicated that the bulk of spending on healthcare is provided by the National Treasury. This reality stems from the necessity beginning in 1994 after the ruling African National Congress (ANC) took power to transform the apartheid system where 14 different bureaucracies were established catering to people based upon their racial and ethnic backgrounds. Consequently, such a system left the majority African and Black (Asian and mixed race) population groups at an extreme disadvantage. Life expectancy rates were highly racialized with the African people suffering from premature and unnecessary deaths. Even today those who can afford the cost utilize private health insurance plans. Conversely the low-wage working class, rural proletarians and jobless people are dependent upon the state for the financial underwriting of their healthcare needs. Within this essay Kikwete emphasized the need to guarantee primary care. Providing primary care to all citizens and residents will address 80 percent of the problems that could potentially arise absent of such services. President Uhuru Kenyatta of Kenya is launching a pilot program to provide Universal Health Coverage to 3.2 million people in four counties. The counties of Kisumu, Nyeri, Machakos and Isiolo are leading the country in communicable and infectious diseases. Kenyatta gave his approval for the UHC Inter-Governmental Committee to proceed in developing Memorandums of Understanding (MoU) between the county administrations and the Ministry of Health. The program is part of a broader national plan to provide free healthcare to all in need of it in Kenya. The worst EVD pandemic took place in 2014-2015 in the West African nations of Guinea, Sierra Leone and Liberia where tens of thousands were sickened and over 11,000 died. The extent of the West African outbreak prompted international interventions from the United Nations World Health Organization (WHO), the United States military and hundreds of healthcare professionals from the Republic of Cuba. An experimental vaccine has been introduced in the DRC in an effort to contain and halt the spread of the virulent strain of this Viral Hemorrhagic Fever (VHF). Since August 1, there have been 300 probable and actual cases of Ebola in the North Kivu and Ituri provinces of the DRC. 186 people have died with 151 confirmed and 35 probable. Of the 34 million HIV positive persons in the world, 69% are in Africa. It is estimated that 23.8 million people on the continent are infected with HIV. 91% of children living with HIV are in Africa which continues to threaten the well-being of successive generations. Over a million people die from AIDS every year in Africa out of the overall 1.7 million who perish due to the disease around the world. 59% of those infected with HIV in Africa are women. Cholera is another disease which has had a devastating impact in some African states. The ailment is caused through the consumption of contaminated water. Recently in the Southern African state of Zimbabwe, a cholera epidemic erupted requiring the declaration of a health emergency. Ebola, HIV/AIDS and Cholera are diseases which trigger health alerts on a national and international level. However, other chronic ailments such as hypertension, heart disease, kidney failure, cancer, malnutrition, alcoholism, drug addiction and diabetes serve to lessen the average life expectancy along with draining the productive capacity of African societies. By providing this glimpse into the healthcare crisis in AU member-states, it points in the direction of the desperate need for a UHC system across the continent. Even though there has been substantial growth in various nations and regions of Africa over the previous two decades, these levels of economic expansion can in no way be considered sustainable based upon the continuing dependency of the region on the trade in energy resources, strategic minerals and agricultural products. In fact the reemergence of the African debt quagmire in recent years is directly linked to the decline in commodity prices on the global market which is still dominated by the western imperialist countries. Moreover, the fragility of neo-colonial dominated states is reflected in the often precarious social positions of healthcare professionals. 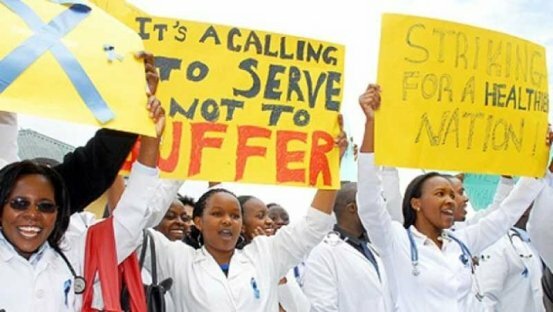 Leading African states such as South Africa, Zimbabwe, Kenya and Nigeria have experienced low salaries for nurses, physicians and medical researchers. Many of these healthcare workers have engaged in strikes demanding the regular payment of salaries, higher wages and improved conditions of employment. Other professionals operating in the medical fields have been recruited to work in the capitalist countries of Europe and North America, further hampering the ability of AU member-states to address the monumental healthcare problems on the continent. As discussed at the beginning of this report, South Africa provides a clear example of the burden facing the public sector in regard to providing medical services for the working class and impoverished. Other governments in Africa are facing similar situations which necessitate the strengthening of state structures. Private for profit healthcare schemes can and do have a role to play. Nevertheless, as is illustrated in the U.S., millions will go without any medical insurance coverage if profit-making is allowed to determine how healthcare systems are administered.